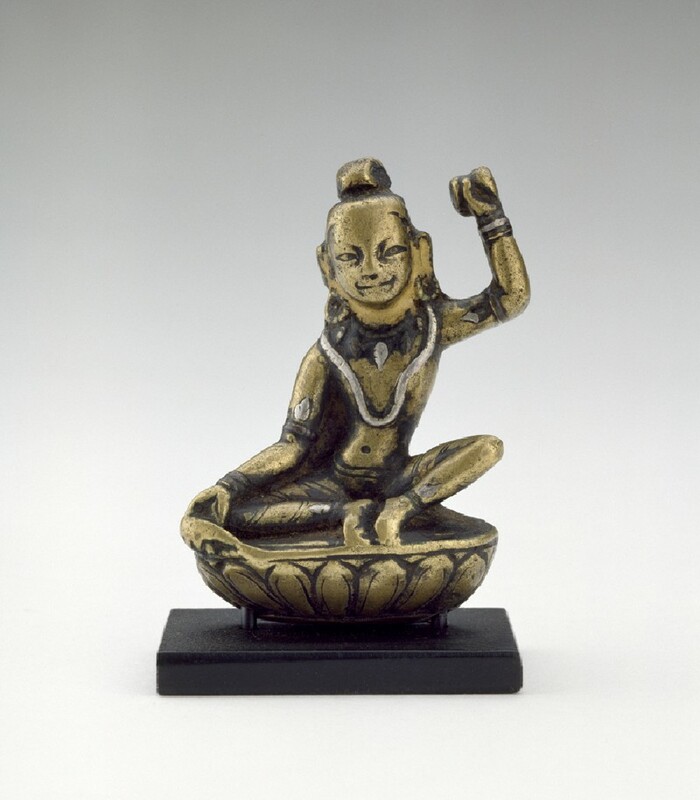 With his lithe and agile body, this Mahasiddha is probably to be identified as Tilopa (988-1069) from the fish clasped in his right hand, its tail resting on the lotus pedestal. Tilopa was the revered guru of Naropa, the guru of Marpa (1012-99), the spiritual forefather of the Kagyu pa monastic school. He is adorned with jewellery because he had served the king of Vishnunagar, but after many years he abandoned the court and lived as an ascetic in a cremation ground. He is frequently represented holding a small fish, due to his reanimation of dead fish as a demonstration of his spiritual powers . In other sculptures he holds the fish and a skull cup . Here the adept appears to hold a damaru ritual drum in his raised left hand; however the object is now so worn as to be indistinct and could possibly have been a vajra clasped at its central knot. His hair is gathered into a topknot, as is typical for a yogin. His facial features are worn due to rubbing, for this sculpture has certainly been much held in the palms of devotees. Yet Tilopa retains his smile and friendly demeanour. The eyes are alert, wide open, the pupils slightly incised. Matt gold paint covers the ears and neck, which accentuates the silver of the disc earrings composed of a chain of silver beads. Silver inlay is present in the upper earlobes, earrings, and oval pendants in the short necklace around his neck. Two oval pendants are also made in copper inlay. The shape of these pendants is very similar to the silver oval ornament on the two armbands and two ankle bracelets, which are composed of a band of copper; the oval silver ornament is placed above. The bracelets have the two bands of copper and a band of silver in between. There is also silver inlay for the single strand of necklace from shoulder to waist. The image is quite richly decorated in proportion to its size and mass, for it is less than 1 cm thick. The topknot is carved in the round. The face has a hollow cavity behind, the arms are rounded in the front of the statue but flat at the back. The legs are fully rounded in a yogic posture. The dhoti has diagonal stripes, alternating large broad bands and two narrow grooves to make a narrow stripe. The image was cast as a whole for the figure and lotus pedestal, which has a very unusual form. The lotus petals are in one layer, and represented as elongated ovals which face the sky. The image has later been attached by two small prongs to the current base which is a completely hollow cavity. A dating to the thirteenth to fourteenth century is proposed in view of its iconography, which predates the Kagyu literary codifications of the late fifteenth century, and also its sense of being an original model, not subject to stereotyping . 1 See Roberts, 'The Kagyu School', pp. 120, 139. 2 See Dowman, tr., Masters of Enchantment, pp. 92-3; also Gyaltsen, tr., The Great Kagyu Masters, cover illus. and p. 34, where Tilopa is represented holding the fish in the left hand, his right hand held behind his body near a water jug. 3 The biographies of Milarepa and the Kagyu masters were rewritten during the fifteenth century and their iconographic models became more standardized at that time.